Authentic rollercoaster experience: The Smaaash Coaster with KOLLMORGEN servo technology. Nowadays servo motors are used not only in industry and mechanical engineering, but also in innovative areas such as Virtual Reality. In this context, word of KOLLMORGEN's high-performance motor and drive technology has spread as far as India. KOLLMORGEN helped to drive the 3 DOF (degrees of freedom) platforms for a high-tech virtual reality application for Smaaash in India. 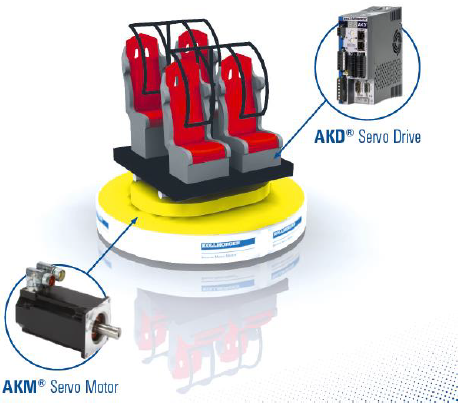 KOLLMORGEN servo-geared motors and drives support the thrill of a roller coaster simulator. Passengers taking the seat in this simulator get an undeniable adrenaline rush as the roller coaster tears up and down through steep curves at breakneck speed. The passengers are shaken in their seats back and forth and laughter and stifled screams bear witness to speed euphoria. What sounds like a fun visit to the amusement park is actually a new application called Finger Coaster, which combines virtual reality with the dynamics of servomotors. With its rollercoaster seats and VR glasses, it almost feels like the real thing for passengers of this rocking rollercoaster simulator. KOLLMORGEN, partnered with Smaaash, the international motion and simulation game factory in Mumbai, India, provides the necessary drive to harmonize technology and the digital world. The KOLLMORGEN servo motors offer high energy efficiency, high performance and durability. In addition, the motors in terms of revs and torque can be precisely graded and specified to the particular application - all of these are factors of great importance for the Smaaash applications, which is why the company has been relying on the performance of KOLLMORGEN motors for around three years now. In the past, KOLLMORGEN and Smaaash had already jointly implemented other similar projects and have now successfully launched the Finger Coaster application. The Mumbai-based company specializes in the development of high-tech virtual reality games and VR entertainment. From sightseeing flights dangling in a glider, to balancing acts at dizzying heights and to the real excitement and emotions of a penalty shootout against a supersonic goalkeeper, Smaaash offers everything that makes the heart of the VR fan beat faster. 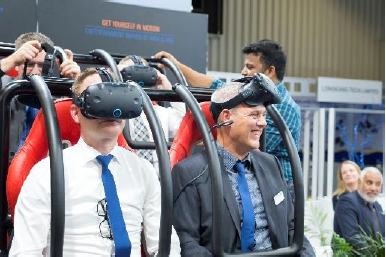 For their latest VR Sensation, a virtual roller coaster, the company has once more collaborated with KOLLMORGEN and decided to use the AKM Servo Motors and AKD Servo Drives. These turn the ride in the virtual roller coaster into a real, live experience, because the characteristic movements of the coaster seats are almost identical to those of a real roller coaster, blasting along on rails thanks to motors and controls. With Motion Control, passengers experience a new level of virtual reality. The trick of the Finger Coaster is that passengers can build their own route via touch function. You can decide for yourself just how racy you want your roller coaster ride to be. Smaaash Chief Technology Officer Kaizad Bajina is very happy: “On the one hand, of course, we appreciate the high-quality products and the many years of experience in partnership with KOLLMORGEN. For our VR simulators we need motors that are absolutely reliable even in the long term and on the other hand, we benefit from global support as KOLLMORGEN extends its reach globally. This results in short voting paths and we can get all the motion-related world class components under one roof." In future, Smaaash wants to convert to the new AKM2G Servo Motor line, which is characterized by a performance innovation of plus 30% torque density, in which the installation volume remains compact. This means that the motors offer significantly more power with the same space requirements. Highly accurate, safety-critical, and highly dynamic applications are even more efficient, thanks to optimized power density. As for working with Smaaash, Vinod Sharma says, "The Finger Coaster project, like previous VR simulator projects, was really exciting. KOLLMORGEN has more than half a million AKM Servomotors in its portfolio, which we can use to support almost any application, but our work is something special for Smaaash VR applications. We are looking forward to the future, especially with regard to our new AKM2G Servo Motor line. The optimized performance of our motors opens up new possibilities in those applications." Since Kollmorgen was founded in 1916 its innovative drive solutions have turned great ideas into reality, made the world a little safer and improved people’s quality of life. 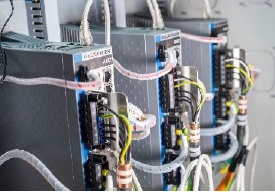 Kollmorgen enables continuous development of pioneering solutions that are unsurpassed in terms of performance, reliability, and user-friendliness. 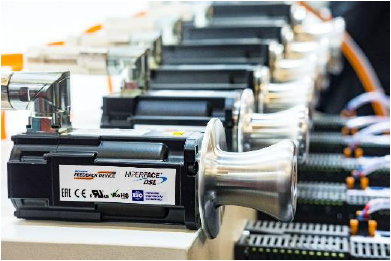 Crucial to these are first-class knowledge and experience in drive systems and components, industry-leading quality and extensive expertise in connecting, and integrating standard and custom-made products. This gives machinery constructors all over the world an important competitive advantage, and gives their end-customers the reassurance that they can rely on the finished application at all times. – Further information: www.kollmorgen.com | THINK@kollmorgen.com. Complex technique: KOLLMORGEN AKD servo drive in detail. AKM2G: The next generation of servo motors already being developed. Great fun: The Smaaash Coaster successfully in motion.